None of the Above - UK and internationally. 'None of the Above' (NOTA) is available as a choice on the ballot paper in some electoral systems around the world. It provides the voter with the option to indicate her/his disapproval with all of the candidates in an election. Like the Blank vote, 'None of the Above' is based on the important democratic principle that public support for elected candidates is only meaningful if people also had the option to show that they did not support any of the candidates. In Ukraine ballots include 'Against all'. Russia had that option on ballots until it was removed in 2006. A 'None of the Above' (NOTA) option is not provided on ballot papers in the UK. Yet it's not good democracy for voters only to be able to say 'Yes' to the candidates on offer, and unable to say 'No'. As always, there is a petition to include 'None of the Above' on UK election ballot papers. But first, voters need to demonstrate the need for the None of the Above option. It's convenient for our elected govern­ments to argue that non-voters are simply apathetic. It avoids the real questions of why. Plus, every political change is better understood, better used, and longer-lasting if it is demanded from the bottom, not delivered from the top. Only when voters deliver signif­icant numbers of protest votes, will a UK govern­ment be forced to acknowledge the demo­cratic case for NOTA. So how can you vote 'None of the Above' in the UK now, and make the democratic case for NOTA on the ballot? 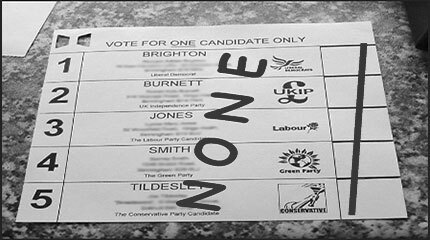 As there is no 'None of the Above' box on the ballot in this UK election: write NONE across your ballot paper, and put a single line through all the boxes. Protest votes will count when the number increases significantly to make them newsworthy. So challenge every non-voter to take part in this election. There is no reason to be silent. If you want a better democracy and politics in the UK, vote for a candidate you trust and want to represent you, or vote NONE in protest. The phrase 'None of the Above' is protected in the UK: it cannot be used by anyone as a name for a political party. Don't be silent. Improve UK politics. While NOTA is not on the UK ballot paper, you can still use your vote to protest clearly. These posters are party-neutral. They need to go everywhere! A petition to include 'None of the above' on UK ballot papers. by Chris Ogden, January 2015.